Sorry I haven't updated in a while, but things have been quite busy around here. The big news is we are moving to Orlando. I am transferring jobs so that we can live closer to family (Ricki's parents live in Orlando). The move date is set for June 1. All three are doing great and getting big. They are crawling all over the house and Zachary is beginning to walk. It is so fun watching them play together. Of course, they are getting into everything. We put child proof locks on all of the cabinets, but Zachary's already figured out how to open them. The girls love whole milk and we are trying to start them on sippy cups. Zachary is still nursing and he is also learning how to use sippy cups. They love french fries, spaghetti, chips, crackers, cheese, and vanilla ice cream. We've been taking them out to dinner at restaurants about once a week. We usually go to larger chains (Chili's, Applebee's, etc.) because most smaller places don't have at least three high chairs. They love to go out in public and being the center of attention. They are constantly talking and learning new things, this has definitely been the most fun stage so far. We moved to Orlando on June 1st. We're living with Ricki's parents until our new six bedroom home is finished. It is expected to be complete in September. Yes, it's a little cramped and stressful living with them, but it allows us to save money until we move into our new home. Zachary has stopped nursing and is drinking from a sippy cup. The girls are weaning to sippy cups. They're been off of baby food for about six weeks, and now eat whatever we're eating. The girls are starting to walk with the help of a walking toy; while Zachary is starting to take a few steps (5-8) by himself. All of them are talking up a storm. Their new trick is that if you ask any of them where a sibling, Mommy, Daddy, Grandma, Papa or Cleo is they'll point to that person. They're also learning where their body parts are. So far they've mastered nose, eyes, and ears. We bought them a huge kiddie pool and they love it. They sit and splash and Cleo joins them. We also bought them floats so they can join us in Ricki's parents' big pool. Ricki found a 'Mommy an Me' class in Orlando and she takes them every Thursday. It's different from their class in Jacksonville, but the kids love it, and it's another chance for them to get out of the house. I have been so busy building web sites for other people I haven't had time to update my own site! Well a lot has happened since our last update. We are still living with Ricki's parents, and our new six bedroom home should be done in THREE WEEKS!!!! We are very excited and anxious to move in; we were originally scheduled to be in around August 15th, but it was delayed six weeks. The girls went cold turkey on the bottles and pacifiers. Now all three of them are solely drinking whole milk from sippy cups. They love spaghetti, crackers, cheese, turkey, vegetables, and all fruit (especially strawberries and blueberries). Zachary is walking and running all over the place. The girls walk with the help of walking toys and can stand up on their own. They will take one to two steps on their own; they should be walking very soon. Their vocabulary is growing every day. They can say Mommy, Daddy, Papa (for Ricki's dad), cup, ball, football, "Go Gators", Cleo (our dog), and much more. They love to watch TV, especially Barney, Blues Clues and Teletubbies. They've also become big sports nuts, and love football! Especially UF football!! Our kids really do bleed orange and blue!!! At their 18 month checkup today, the doctor said they are all doing great and are perfectly healthy. His only comment was that we need to increase Lindsey's caloric intake (by adding Carnation Instant Breakfast to her milk) to help her gain some weight. Ricki and the kids signed up for the Fall Session of Mommy & Me, which started last Thursday. This time she's taking it with a friend and her daughter, so she knows one other person in the class. Ricki's 10-year high school reunion was in August. She was very busy with that over summer, as she was on the reunion committee (we designed the Lake Brantley Class of 1988's Reunion Home Page). It was a lot of fun for her to see people that she hadn't seen in 10 years. Although there was no official award, Ricki had the distinct honor of having the most kids at one time (there were also two sets of twins born to classmates). 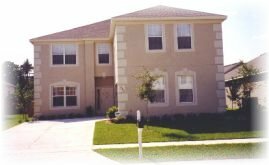 We finally moved into our new house in Orlando. It is so big (6 bedrooms and 4 bathrooms) that we do not have enough furniture to fill all the rooms. The kids love it. They each have their own room and have tons of room to play in the house. We also have a fenced in backyard, and they love to play in it. They have learned to climb the stairs by themselves, but still are not sure about coming down by themselves. The big news is everybody is finally WALKING!!! They are also eating with us at the table. We took the trays off their highchairs and pulled them directly to the table. They love it! I can't believe that the kids are already 21 1/2 months old! Time is flying by! We've been in the new house over two months now, and we're loving it. The kids really like having their own room, and love to go into their siblings room in the morning to wake any late sleepers. They've all become "little people" and are no longer babies! They're talking up a storm! They're all saying two and three word sentences! They're also their parent's kids, as they've become HUGE Disney fans and are obsessed with Mickey Mouse! Right now we're planning on taking them to the Magic Kingdom some time next month for their first visit there. They love to watch t.v, we have four Mickey Mouse Sing Along Song videos that they watch every day! They also love to watch Blue's Clues, Teletubbies, Barney, and Big Comfy Couch. Their other obsession is with football (especially Hannah). We're getting worried about what we're going to do after the Superbowl next month. We've turned the backyard into a playground. We've bought them a Little Tykes Playhouse, the tugboat sandbox which turned into a ball pit, a car, and a Treehouse Clubhouse. We also bought them a redwood play system (formally known as a swing set). It has three swings, a fort with a steering wheel, and a slide. It's HUGE! It was installed last Sunday and the kids have played on it every day! We put up three toddler swings for them and are saving the regular seats for when they're older. All three can climb up the ladder to the fort and can slide down head first. One thing we liked about this set was that we can add onto it when they get older. We're planning on adding monkey bars, a "penthouse" which is a smaller fort that sits on top of the monkey bars, and possibly a 360 degree slide when their five or six. We took the kids to Disney World last month. We bought a annual pass so we can take them whenever we want (one of the great advantages of living in Orlando). We weren't sure how it was going to go, and I was planning for the worse; but amazingly they loved it and were very well behaved. We had pictures taken with all the Disney characters. We went on "It's a Small World", "The Country Bear Jamboree" and the "Tiki Birds". They had a blast. In fact, we're going back to the Magic Kingdom tomorrow! I have off for Presidents' Day, and we thought we'd take them on more rides this time. We've signed them up for pre-school starting in the Fall. They will be going three days a week from 12:30-3:30. There will be a total of twelve kids in the class, including another set of triplets. All three are talking up a storm now! They're saying four and five word sentences. Zach loves to play with cars, especially his Matchbox cars, and the girls have really gotten into dolls. It's neat to see them develop into "small people." We are also planning their second birthday party (3/5/99). It's hard to believe they are turning two. Time is flying by!!! We're having a huge party here at the house for about 50-60 people.